Just taking a glance at our small photo gallery at your right, you can see that Orlando Party Bus has a really impressive selection of buses that is at your service whenever you need them. We welcome your calls and emails anytime, and we're always happy to get as involved in the travel-planning process as you'd like us to. Whether you prefer your party bus company to be hands-on or hands-off, we can accommodate your preferences and make your trip exactly what you want it to be. Orlando Limo Bus is the company for you. When you do rent the services of Orlando Limousine, what you'll get is personalized and chauffeured service to all of the exciting destinations and venues throughout Orlando, Florida. This beautiful and sunny state of ours has never looked better than it does through the panoramic windows of a luxury party bus. Getting together with your friends for a road trip takes on a completely new meaning when your vehicle is a limousine bus! Whether for short trips with many stops or longer trips with one ultimate destination, we're for you. Our vehicles are very nice right from the get-go, but then we put in extra work to outfit them with even more exciting features such as multiple flat screen televisions, high quality stereo systems, CD and iPod capabilities, color-changing LED and fiber optic lighting, and of course the built-in bars and coolers that all our party going customers adore so much! We suggest stocking them not with just liquor but also with some bottled water and snacks! You've got to fuel up your tank if you want to be able to party hearty throughout the evening! If you're new to the world of party buses, we'd love to be the company that introduces you to this exciting realm of festive travel! 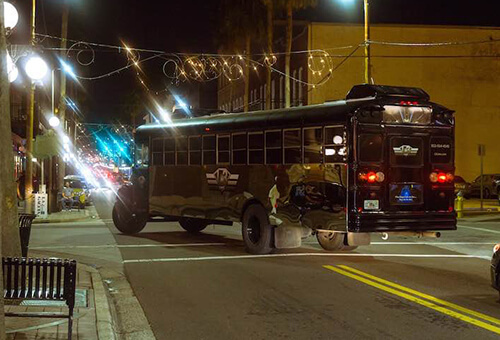 It's an absolute blast to hit up all your favorite Orlando hot spots while in the comfort of a luxurious party bus! These limo buses are superb in every way. Sparkling clean, decked out with all the features we mentioned above, these are the kind of vehicles that dreams are made of. You and your friends will cruise the city streets in the utmost luxury and style, feeling like a million bucks while spending a minuscule fraction of that! Everyone who passes you on the street will be envious of your outstanding ride. And of course, you can even drink on board, enjoying the fact that your professional chauffeur serves as a designated driver all night long. Does it get any better than that? We don't think so. The booking process is straightforward, simple, and so incredibly fast! You can callus right now (even if it's late at night, we are here 24/7!) and all you have to provide us with is the date of service, the type of event, and the number of passengers, and you will instantly have a price quote! You can get quotes from other local companies if you like as a comparison, but you'll find that we are the most competitive and by far the highest quality in town. When you decide to lock down that date and make it official, all you've got to do is call us back and make a quick credit card deposit. This ensures that your vehicle is all yours on the date of your event and that no one else can claim it! Speaking of claiming a vehicle, it's up to you whether you'd like to choose it yourself or let our expert team do the picking for you! You're welcome to come down to our place of business to take a grand tour of our property, viewing the vehicles and trying out their mind blowing features to choose the best one for your exciting event. But if time is of the essence and you would rather trust us to choose the most appropriate vehicle for your night out, believe us when we say that no one is better at that than our team. We choose vehicles for our customers all day long, based on the type of event they'll be attending and the number of passengers that will be traveling with them. There's no question that we've got the ideal vehicle for you. The only question is whether or not you want to take a tour and choose it yourself! We've also put together a vehicles page right here on the site in case a quick virtual tour is all you need to know what's best for you! We hope you enjoy everything we've put together for you here and we hope you won't hesitate to reach out with any questions that you have! 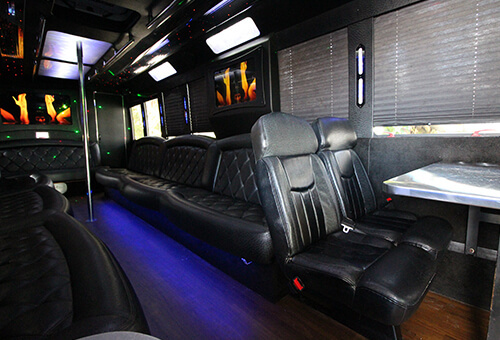 Enjoy browsing PartyBusOrlando.net and get in touch when ready! You still need service but you only found our site when on vacation in Orlando? If you're from Texas check out El Paso Party Bus or Austin Party Bus. In Michigan check out Lansing Limo Bus or for the state of Washington Seattle Party Bus. At least one built-in bar in each bus, and up to four in our larger vehicles! We're the #1 luxury transportation company in the Greater Orlando area. We work hard to keep our loyal customers coming back time and again. Give us a call to find out what sets us apart from the competition.